No, not teddy bears guzzling Dr Peppers and chomping on fish sticks. Just us city types, woefully ill-equipped and unsuitably dressed for a trek across the deepest darkest swathes of Cannock Chase. 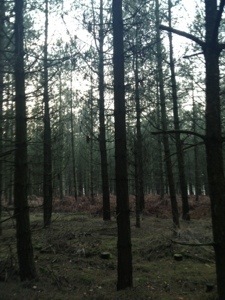 For today was the day we went location scouting for the front cover of Runners. As usual, things didn’t go quite to plan. For a start, I don’t think we could have chosen a colder day. Some very good friends and their son accompanied me and my two daughters to act as models for the day so that we could get some idea of composition for photos. And while said friends were old hands at wandering the countryside, as for me and my girls, if we’ve strayed into a yard with weeds growing through the cracks we feel like we’ve been on safari. So I pitched up in knitted boots and the thinnest jeans I own (only because these jeans fitted inside the boots, you see) and the oldest daughter was almost as bad in pumps and a bomber jacket. At least the little one had enough sense to make up for us and attempted to put on outdoorsy clothes in her padded coat and space boots. We arrived at the first location to find a huge search and rescue operation going on. Now, this is where I show how shallow I am and admit that I got quite excited by all the drama because my brain was ticking over with story possibilities. So we moved on from there after a while, really because we were in the way, even though I dearly wanted to sneak inside the operations tent and spy on them. Our next location was better apart from the deer that I nearly ran over parking up. Location number three was late in the afternoon and the icicles had already started to form on my eyebrows as we arrived. We trudged into the deepest section of wood and did some really nice posing, and were just making our way out as the sun went down when I noticed an eye-watering pong coming from our group. Everyone checks their shoes. The culprit is little daughter, the evidence slathered all over her pink space boots. But it’s not lovely veggie deer pellets, oh no. It’s radioactive orange, sloppy, full-bore carnivorous dog cack. And guess who got to clean them up. Talk about suffering for your art. When we take the actual models up there, I’ll remember to take a hosepipe.